Ultherapy® is ideal for someone looking to take control of their face and neck skin tone with a non-surgical treatment. 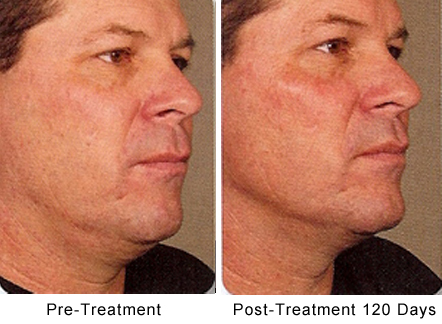 Ultherapy® helps battle the aging process by LIFTING, TONING, and TIGHTENING by targeting deep facial structures. 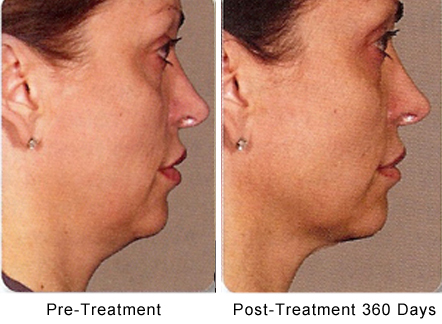 Ultherapy® is perfect for someone who wants to take control of their fight against facial gravity, someone who is considering surgery (facelift, neck lift, brow lift) but is not quite ready to take that step, or someone who is in between surgeries and just needs a little “freshening up.” Ultherapy® is ideal for patients who are not good surgical candidates or who are wishing to avoid the risks, cost, and downtime associated with facial surgery. Ultherapy® is an FDA-approved treatment that uses a high-intensity, focused ultrasound to reach the deep structures of the face to lift and tighten. Ultherapy® is a safe, highly studied, non-invasive, and non-surgical skin tightening and lifting treatment that allows your skin to remain intact. It is through the body’s natural healing process that your facial structures will slowly tighten over the next 3-9 months. This gradual process leads to a more natural and refreshed appearance. Ultrasound technology is the same device as used for imaging babies with pregnant women. It is a smooth hand piece that glides along your face and neck. With the ultrasound, the experienced staff at Radiance is able to visualize the deeper structures of your face and neck and deliver with precision a beam of high-intensity, focused ultrasound energy. This energy causes an inflammatory response. This response causes new collagen growth that tightens and lifts facial structures gradually. The gradual changes allow for a “natural” improvement in your appearance. Skin is more youthful and better positioned after the treatment. Ultherapy® will lift the brow, which in turn, decreases the appearance of the excess skin on the eyelids, opens up the eyes, and gives a more refreshed, rested appearance. 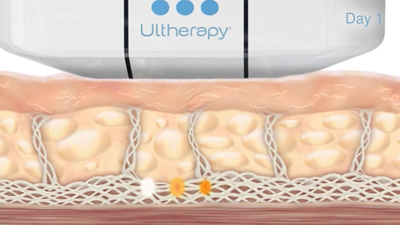 Ultherapy® is the only FDA-approved device on the market for tissue LIFTING. We are now proud to offer Pro-Nox™ – an inhaled, patient-controlled analgesic to help you feel better during your Ultherapy® treatment. Pro-Nox™ is a mixture of 50% oxygen and 50% nitrous oxide and the benefit is immediate pain relief, anxiety management, and a calming effect. Pro-Nox™ has been FDA approved for use in patients during procedures and has quick recovery time. Consider using this system with your next Ultherapy® treatment; $75/treatment. Many patients see some level of tightening and lifting shortly after treatment. However, as the body “heals,” you should gradually see results over the next 3-9 months. 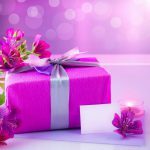 The key is that results should improve with time! 60 minutes.Patients may feel some discomfort while the Ultherapy® ultrasound energy is being delivered. This is temporary and indicates that collagen building is taking place! Discomfort may be classified as mild to moderate but really depends on the patient and can vary. Comfort also depends on the location of the area being treated – some areas can be more sensitive than others. Patients can take ibuprofen for discomfort and can drive themselves to and from the treatment. Patients who are a bit more sensitive can be provided with Vicodin but will be required to have a driver after the treatment. No special after-procedure care is typically required. Varies with each individual. Depends on the results that you seek. 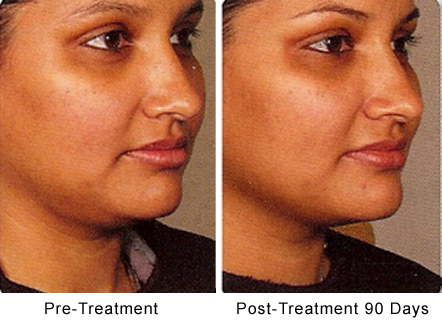 Ultherapy® will cause lifting and tightening but the aging process will continue. Frequency of treatments will depend upon the quality of your soft tissues, your aging process, and your desired results.The majority of people only require one treatment every 1-3 years. Some individuals may desire to have more than one treatment (as frequently as every 6 months), depending on the skin’s tone and laxity and the body’s response to Ultherapy®. Discuss with us and your primary physician your exact medication list prior to stopping, but typically avoid your blood thinners (such as aspirin, ibuprofen, alcohol, omegas, flaxseed oil, fish oil, vitamin D3, and vitamin E) for 3-5 days prior to your treatment. The most common side effects can be flushing, redness, swelling (for a few days), tenderness/tingling (may last for a few weeks), and in some individuals – bruising and/or numbness (may last a few weeks). Are you interested in learning more about Ultherapy®? 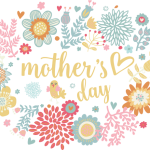 If so, please contact Radiance Spa Medical Group for more information, or to schedule a consultation.